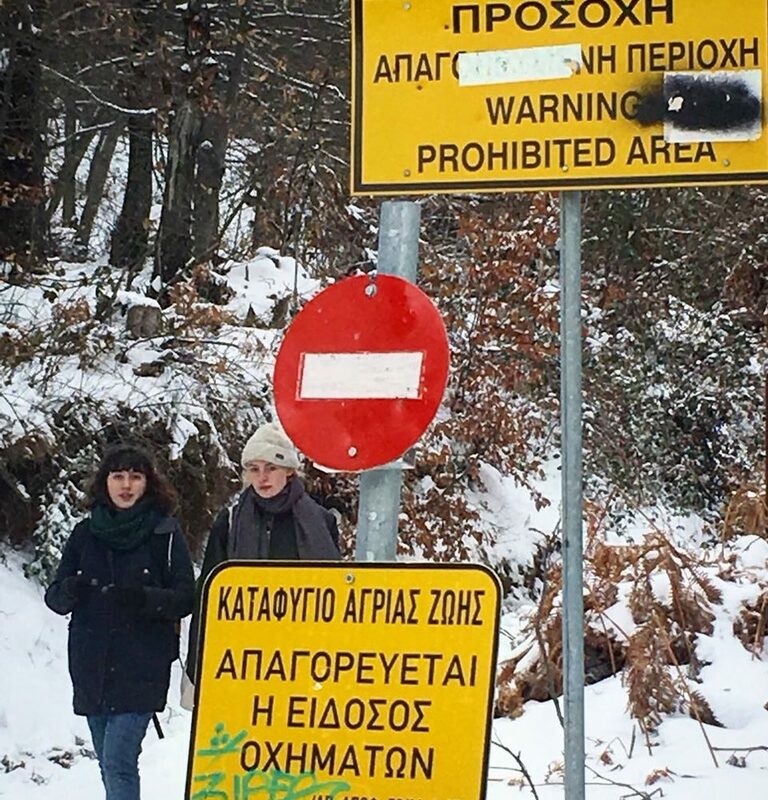 DAI WEEK #5: Thessaloniki - trip to Chortiatis, January 2018. In the academic year 2018-2019 Bulegoa z/b joins the Dutch Art Institute’s MA Program as partner in the COOP study group Curating Positions: Logics of Montage. In Between the Cinematic Apparatus and the Exhibition. This COOP will take the cinematic apparatus as a starting point to think about tools and methodologies around curatorial knowledge and collective work. Opening the backstage, the pre-production and projection moments such as scouting, scripting, (image/text) editing, the final gathering in a dark room, and using them as tools to gather knowledge and research, this study group will mainly experiment with the potentialities of montage as a constituent element in the filmmaking process and apparatus, but also as a relevant action in the framework of exhibition-making. Montage in film is one of the most important tools, bringing together writing, listening and seeing. It can also be considered as a way of writing a film and was used to remodel the viewer’s ways of seeing; light traces might be noticeable in the acceleration of the filmcut in feature films, which make older and slower cuts more difficult to endure today. Understanding montage as a similar operation to the curatorial, in which, through the assemblage and collection of things (images, sounds, artworks), something new emerges: A collective form that is something more/else than the sum of its parts. Questions around filmmaking, engaged cinema, documentary and fiction, performance, audiences will be brought-in through these diverse tools that the study group will use as research methodologies. One of the tools will be an inversion of an element of classic film production, scouting for location. The study group will focus on de-colonial cinema, cinemas of resistance, feminist image making, and questions of militant filmmaking that will be discussed through regular screening sessions. The politics of filmmaking is posed in the present while taking into consideration a certain tradition of militant film production from the 60s and the way the filmic apparatus has been deconstructed since then. Following Godard’s demand to make film politically, the coop will culminate in a collective project. Curating Positions: Logics of Montage. In Between the Cinematic Apparatus and the Exhibition is guided by Leire Vergara, Marwa Arsanios and Leon Filter. With the contribution of Beatriz Cavia and Miren Jaio, Leire Vergara’s colleague at Bulegoa z/b, the new partner of DAI. The Dutch Art Institute a.k.a. DAI, a.k.a. DAI ROAMING ACADEMY, is an itinerant program that fosters a variety of praxes at the intersections of art and theory (both seen as un-disciplines), and invigorates (collective) thinking, researching, voicing, making, roaming, curating, performing, writing and publishing. Embedded in the support structure of the Graduate School of the ArtEZ University of the Arts our precious program is, for the largest part, funded by the Dutch Ministry of Education.